This pattern was so hard to sew. Who drafted this pattern anyway? Oh, wait, it was me. And, in case you were wondering, shoulder seams are really useful and not at all extraneous. No, you weren’t wondering? It was just me, then. And now I know. It looks kind of nice though. After a hanger fix, I may be able to wear it. Umm, linen base fabric. Rayon (?) lace. Cotton tulle. Metal buttons. 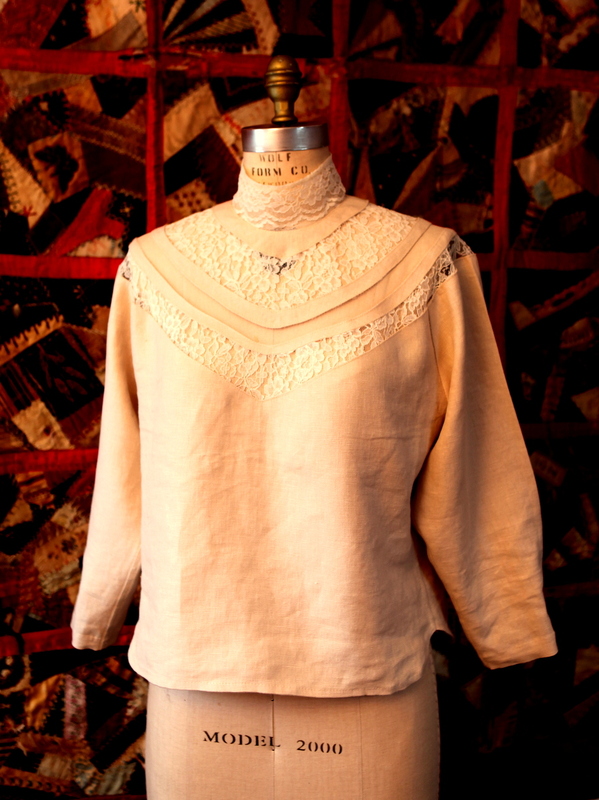 I thought it would be interesting to sew a round yoke with no shoulder seams. And I guess it was interesting. I would not recommend it, though. 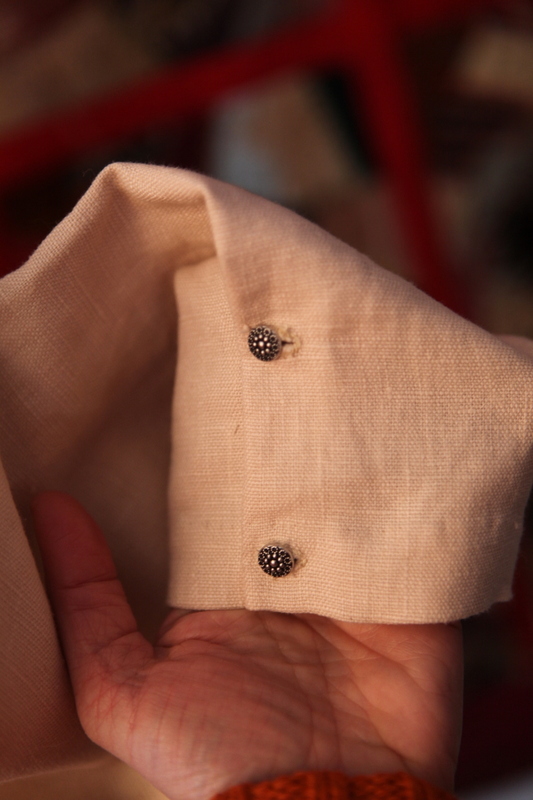 sleeves are hemmed, folded over, and buttoned. No cuff. This entry was written by Claudine, posted on February 10, 2015 at 1:01 am, filed under drafting, Lace. Bookmark the permalink. Follow any comments here with the RSS feed for this post. Post a comment or leave a trackback: Trackback URL. I love the round yoke! (Even though I take it it was a pain in the neck). The layering is creative and interesting and it looks awesome from the side. Plus, your fabrics are lovely. It’s a beautiful top! Me too. Love that yoke! 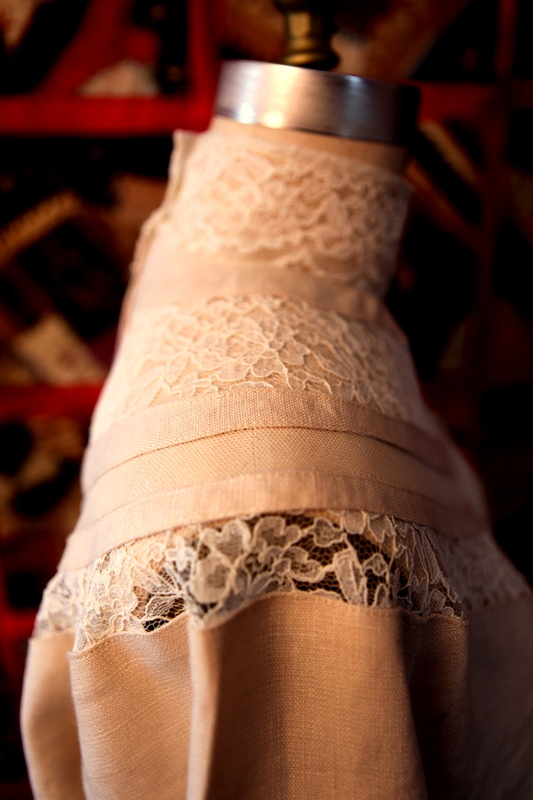 I wouls haver thought to pair lace and linen but it looks amazing! Did you draft the pattern? Thanks! Yes, I drafted the pattern. I could not find a commercial pattern with the details I wanted. After sewing it, I know why. An intermediate level sewist would not have been able to make this work. haha! Your ‘wondering’ was hilarious. Looks great despite the angst of no shoulder seams. 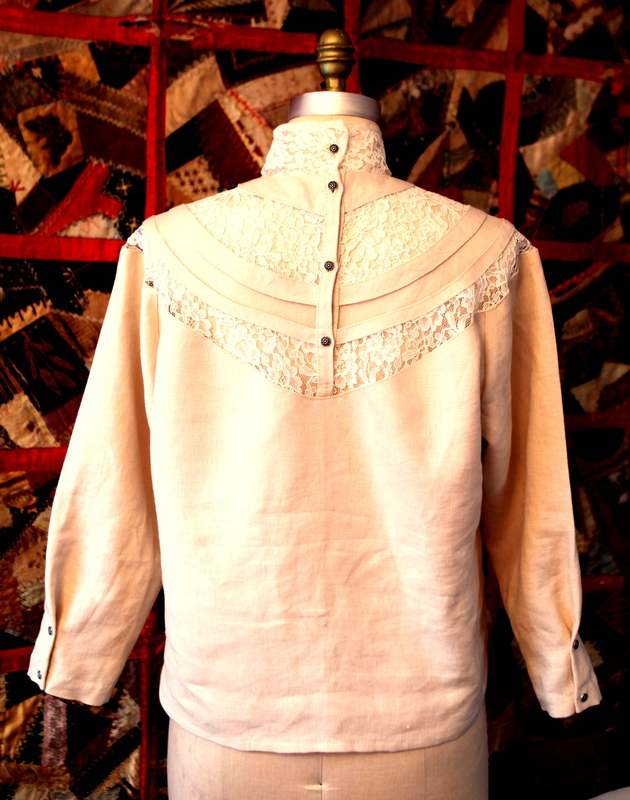 I’ve seen lots of circular yoked garments, and have sewn a few (not me-drafted, of course). I’m curious about what was difficult in the pattern – working with many types of fabrics, perhaps? 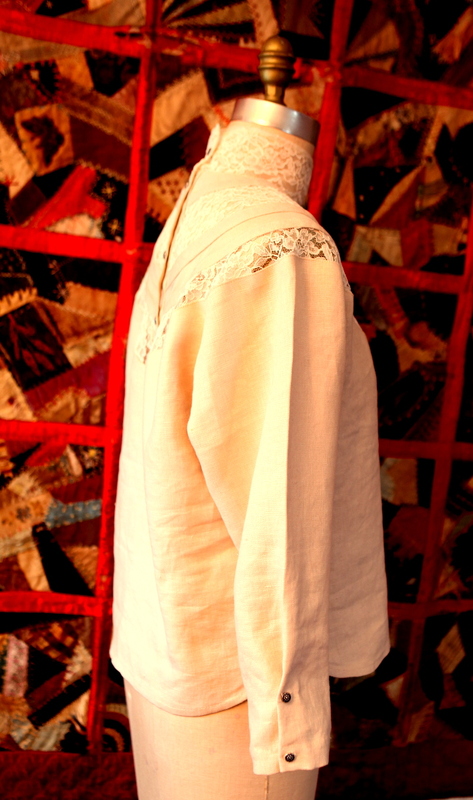 – since the premise of no shoulder seams appears to be fairly doable. Did you drape your yoke and develop your pattern from that? Your buttons are to die for, btw. The whole effect is gorgeous. I drafted it from a Stylebook sloper. The yoke (in pieces) wound up being more than a full circle. Because I was piecing it in strips, I could mess with the grain when I was cutting to cut the strips out. Except for the innermost ring, which is pieced. I’m not sure if the weird grain thing is what made it so difficult to sew, or if it was something else. Could you have sewn a lot of these seams with tearaway stabilizer underneath to help? In your Instagram photo the grain lines are very clear and the details are just lovely. Sometimes we put ourselves through these trials for a reason…whatever that is! In the end, the results are jaw dropping! Did you take any more photos in the process? Hmm, stabilizer might have been a good idea. I would not have been able to sew right sides together, but I may give that some thought if I do something like this again. Oh, and no, I have no more photos of the process. I have a hard time changing gears to stop and photograph my works in progress. You might also check out the drafting of 1880s bodices — princess seams front and back, but the shoulder is carried over from the front to the back, with no seams. The bias gave ample opportunity to achieve a close fit on a corseted figure, and made a very pretty seaming detail on the back of a bodice. Godey’s Ladies Book, Harper’s, etc. had good illustrations. Dover Books has reprinted a good many 19th century pattern books that are a good start. Thanks! If I were doing costuming, that’s what I would have done, but I really wanted a contemporary fit. This is something that I’m thinking I will wear in my everyday life. Hahaha! 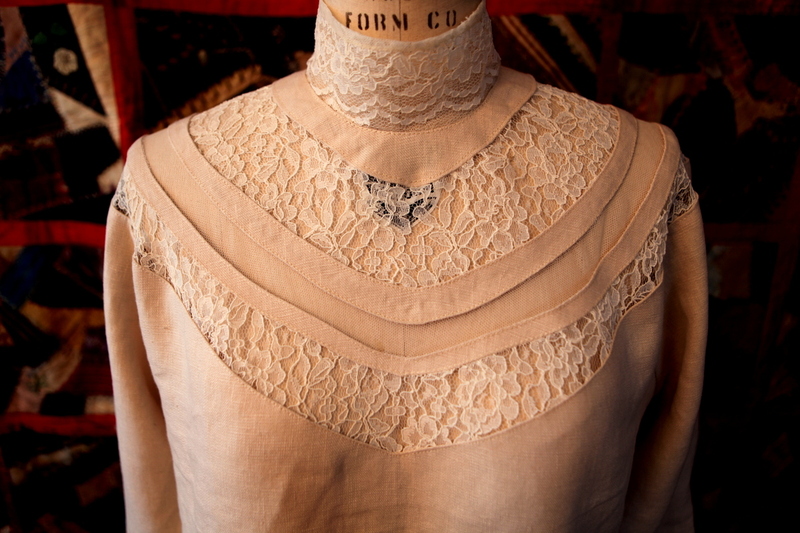 I would totally wear the 1890s blouse in everyday life. I certainly get a lot of use out of my Folkwear patterns Walking Skirt. It’s just gorgeous. I hope you can make it wearable! I like the cuff-less buttoned sleeve detail. It’s lovely and those sleeves are fabulous!